In January 1974, at the height of the three-day week crisis, the head of the civil service, Sir William Armstrong, suffered a stress-induced mental breakdown. According to several accounts, Armstrong was found naked on the floor of the Downing Street waiting room, chain smoking and raving about the end of the world. The following morning, he convened a meeting of his Permanent Secretary colleagues and harangued them about preparing for Armageddon. Armstrong was admitted to hospital but was back at work within a few weeks. Three months later, he left the civil service and became chairman of Midland Bank. Armstrong’s breakdown was hushed up and the lessons ignored. Although colleagues later said the warning signs had been there for years, Armstrong received no support and never talked about his mental health problems. The impact of severe stress and overworking on his ability to advise the Prime Minister at a crucial juncture in Britain’s history was never considered. And the effect on Armstrong’s own health – he died just a few years later – was perhaps greater than he knew. On the surface, the contrast with today’s civil service couldn’t be greater. Government Chief People Officer Rupert McNeil has spoken openly about his problems with anxiety and encouraged colleagues to do the same. Departments have health and wellbeing champions, and have rolled out a plethora of mental health initiatives in recent years, including mental health first aider training, expanded employee assistance programmes and networks where staff get together to talk about workplace problems and the impact on their mental wellbeing. When Lord Dennis Stevenson and MIND chief executive Paul Farmer published their independent review of workplace mental health, Thriving at Work, in October last year, the government not only accepted all the recommendations as an employer, but designated the civil service as an ‘early adopter’ of the mental health standards laid down in the report (see box). It was, and was intended to be, a clear signal that the civil service is now taking mental health seriously. But it still has a lot to get serious about. The Stevenson-Farmer report says the scale of the mental health challenge in Britain’s workplaces is “greater than we thought”, and the civil service is no exception. 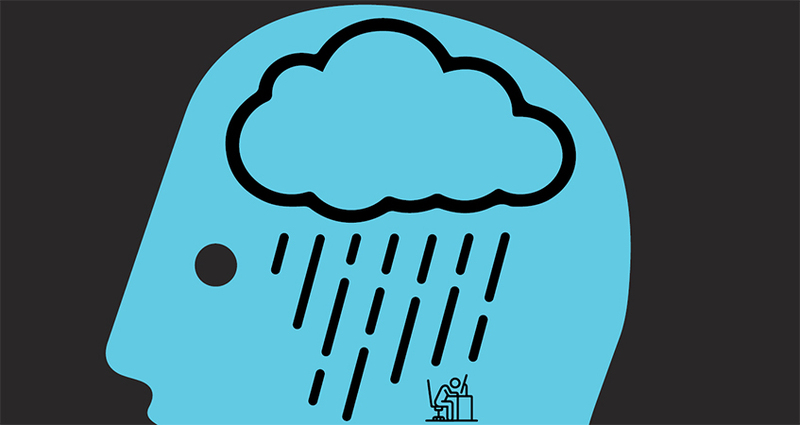 According to MIND’s Workplace Wellbeing Index, public sector workers experience poorer mental health than those in the private sector, with one in six describing their mental health as “poor” and 53% saying they regularly feel anxious at work. Research by Deloitte’s puts the cost of mental health problems to the government at around £1,500 per civil servant every year – again, higher than the average for private sector employees. “Working in the civil service is demanding,” says Faye McGuinness, head of workplace wellbeing at MIND, who works with the civil service leadership on implementing the findings of the report. She cites long working hours, regular inspections, lack of interaction with colleagues, and cuts to budgets and staffing as factors that can put pressure on the mental health of all public sector workers. “The onus should be on employers to support their staff through the difficult times, so they can come to work at their best, and in turn get the best outcomes for the people they represent – which is why implementing the recommendations [of the report] is so important,” says McGuinness. Work across Whitehall is being led by Jonathan Jones, the Head of the Government Legal Service, who is also the civil service health and wellbeing champion, with support from the Civil Service Employment Policy (CSEP) unit in the Cabinet Office and wellbeing champions in each department. The newly rebranded Ministry of Housing, Communities and Local Government (MHCLG) is widely recognised in Whitehall for being ahead of the curve on supporting workforce mental health. “When I joined the department in 2016, what really struck me was the openness within the [health and wellbeing] network, but also more broadly to talking about mental health issues,” says Jillian Kay, the ministry’s health and wellbeing champion. In 2015, the department introduced mental health first aid training and a mental health ambassador listening and support service. MHCLG now has 150 trained mental health first aiders and a thriving health and wellbeing staff network. Last year, it was chosen to design and deliver the mental health awareness workshop at Civil Service Live. Kay emphasises that engaging senior managers is crucial to shifting the workplace culture towards improving mental health. “I was a bit surprised to see members of the SCS on the mental health first aid training when I joined, but actually we’ve now trained 12 SCS members,” she says. “More than 40 first aiders have gone on to become mental health ambassadors, and they provide a listening and advice service to people who need it, including line managers who want to support their staff.” The ministry also runs specialised wellbeing workshops for senior leaders, including some facilitated by FDA national officer Jane Cockram. "We all have good and bad mental health at different times according to what we’re experiencing. It’s important to make sure it isn’t a niche agenda"
Staff resilience and good mental health is very much a live issue for Kay as a manager. In her ‘day job’, she leads for the department on Grenfell recovery and resilience. “Some of our teams have been working with Kensington and Chelsea Council on support for all those affected by the fire. So I’ve get a set of staff who’ve had to be quite resilient over the last year,” she says. At the same time, the civil service needs to identify and meet the needs of staff who are at a higher risk of developing mental health problems because of the nature of their work; these may include “mainstream” civil servants like Jillian Kay’s MHCLG staff, as well as more obvious candidates like people working for the security services or the National Crime Agency. One of the persistent themes in the Stevenson-Farmer report is the need for employers to move away from the traditional ‘performance management’ approach, where mental health problems – if they were discussed at all – were tackled as issues of individual capability. This lead to a ‘culture of silence’, where employees kept quiet about mental health problems for fear of demotion, reprimand – or worse. This also means managers taking some responsibility for the mental wellbeing of their staff, something that is reflected in one of the Stevenson-Farmer report’s most striking recommendations: that civil service leaders should have the mental wellbeing of their staff enshrined in their performance objectives. "Maybe more managers are willing to have supportive conversations now, but not enough to change how people feel." This would certainly be an unprecedented step, with big potential to drive meaningful change. But how it will be implemented across the civil service remains to be seen. “We don’t yet have any other examples of this being done before,” admits McGuinness. Since returning to work, Duncan says he has benefited from some adjustments to his workload and from taking part in a staff wellbeing network. “Colleagues have been much more supportive than I expected and [management] have been willing to make some changes, which have definitely helped me,” he says. But he still fears his career has suffered and doesn’t feel confident about pursuing promotion opportunities in the near future. “I still feel there’s this bit of a stigma hanging over me,” he adds. Duncan still doubts many of his colleagues would be willing to discuss mental health problems openly with senior managers. “Maybe more managers are willing to have that kind of [supportive] conversation now, but I don’t think it’s enough to change the way people feel,” he says. For Duncan, the big challenge is ending the culture of silence around mental health, and that takes time: “In the end, it’s not about what support programmes there are, but whether people have trust and confidence to use them. I don’t think we’re quite there yet,” he says.